MANDALUYONG--San Miguel Beer made its way to the PBA record book by becoming the first team to capture the PBA Philippine Cup championship for four straight years. For team captain Arwind Santos, the Beermen's latest title conquest is their gratitude to how the San Miguel Corporation treated them. "Nakakatuwa tapos sobrang masaya kami dahil nasuklian namin yung magandang alaga sa amin ng San Miguel management--sina Boss RSA (Ramon Ang), Boss Danding [Cojuangco], Boss Robert [Non], [at] Boss Al [Chua]," Santos told Dugout Philippines on Wednesday night. "Mahirap kasi yung inaalagaan ka tapos hindi mo man lang masuklian ng kahit ano." Santos then lauded his higher ups for keeping their faith on them, saying, "Ramdam namin kung paano nila kami suportahan." As a way of saying thank you to the team, SMC threw a victory party for them at its head office. 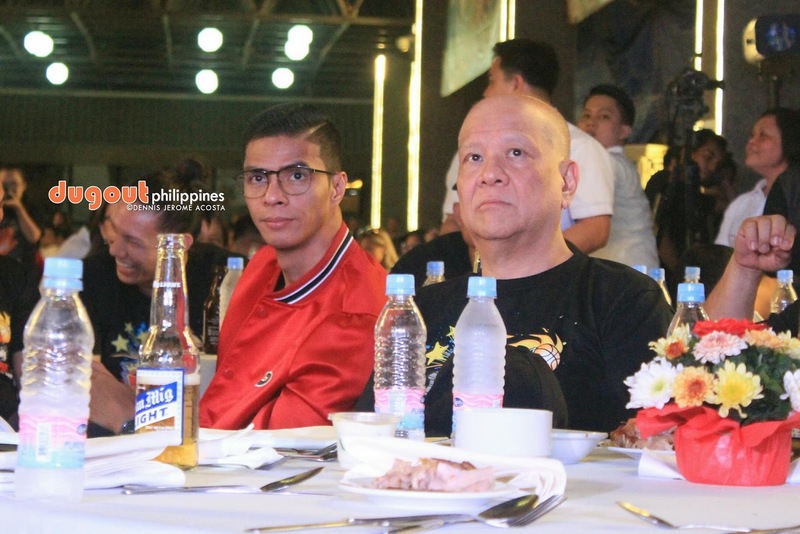 The entire team was there along with Ang, SMC's president, and San Miguel Brewery president Bobby Huang. Fans also got a chance to get up close and personal with their favorite players while listening to the beat of top local band Itchyworms.